White Rock, with more sunshine than any other spot in BC's Lower Mainland, is almost picture-perfect, with beautiful beaches, a promenade that runs for 2.5km along the beach-front and a 1,500 ft. pier that is a favourite with visitors. Located adjacent to the US/Canada border, White Rock is a short half hour drive south of the City of Vancouver, BC. 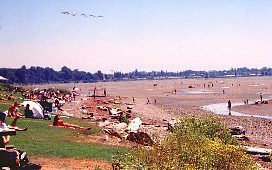 The community of White Rock is named for the very large white rock on the beach. Legend has it, that a Sea Gods son fell in love with a Cowichan Indian Maiden. The lovers after being rejected by both fathers, vowed to make a new home. The Sea Gods son on seeing the big white rock, picking it up, threw it across Georgia Strait and then with his Cowichan princess, they followed the rock to begin a new life and a new tribe. Accommodations: The White Rock area offers numerous bed and breakfasts, hotels, motels and RV parks for campers. Main Industries: A summer seaside resort. Access: White Rock, British Columbia, is located 45km (28 mi) southeast of Vancouver, BC, on Hwy 99. Bordered on the south by the US, north and east by the District of Surrey, and west by Semiahmoo Bay. BC Bus Transit serves the area. Recreation Facilities/Activities: Swimming; boating; beachcombing; golfing; fishing and walkways. Dine at a quaint cafe or bistro; enjoy Old English fish & chips by the seaside; browse the art galleries; shop in the boutiques. 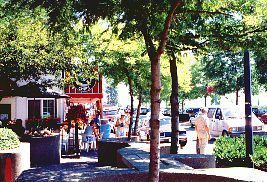 Local Attractions: White Rock Museum and Archives at Station Centre; White Rock Pier: Sunnyside Road and Crescent Beach; Tour de White Rock (June); Festival of the Arts (July); White Rock Sea Festival (July/August).